Another results show full of random pimpage and major filler. So basically, the usual. So far I have been super impressed with the group songs this season. Tonight I have determined my new theory is that there is a backing vocal track but the idols are singing their solo verses live. No lip syncing, fortunately. Their harmonies were wonderful and everyone hit their marks…another successful group song! My favorite Ford commercial yet this season. it must be because they filmed it in a cool house with cool modern furniture. I have a soft spot for that, obviously. Crazy Suspenseful Results Show: “Jimmy For President” edition! The first results show of Season 11, and it will inevitably be the most intense, because we are cutting HALF. After a bunch of filler footage and the first commercial break, we chop chop right to the chop chopping. Jeremy, Phillip, and Chase are up first. They get their recaps along with Jimmy Iovine’s comments. Jimmy didn’t seem to be a big fan of Jeremy or Chase, but he is a huge fan of Phil. And America agreed with the sanity of Jimmy! Ryan tells us that there were 122 Million votes. That’s what happens when you leave the phone and text lines open for 4 hours, and tweens have unlimited texting packages. There is going to be a whole generation of girls born in the late 90s in North Carolina that will have carpel tunnel. An epidemic, is coming, I’m telling you. After the obligatory judges intro, we get the kids singing their first group song…Born This Way. Didn’t they already do this as a group song? Can’t they pick another GaGa song? shouldn’t she have, like, a greatest hits album to choose from? The first “Idol with their idol” performance of the evening is James Durbin singing with Judas Priest. I loved this! Loved it! Pyro! Pyro! America is giving metal a chance, James! The judges get ribbed a bit in some video packages. I wish Randy would realize that he sounds ridic, and this video clip is not laughing with him, it is laughing at him. Jacob Lusk sings with Kirk Franklin and Gladys Knight, and a huge gospel choir. I think they pre-pay a year in advance for a gospel choir for the finale, so Jacob got the honor this year. Casey and Jack Black sang Fat Bottomed Girls! This was hilarious! They should do skits and upload them on youtube. Viral, people! Viral! The ladies are up next singing a Beyonce medley – with Beyonce (naturally. 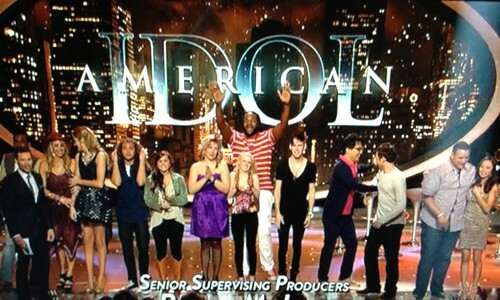 It is the Idol Finale after all.) Haley sounded amazing, Pia sounded pretty good, and surprisingly Asht(h)on sounded pretty good, too. But Beyonce kind of took them all to school. That girl has some bootylicious skills that no other human can match. Haley is up next dueting with Tony Bennett singing Steppin Out With My Baby. Love this! This girl goes from singing Zeppelin to singing with Tony Bennett. I believe the “sing the phone book” line could be used with this one. I already miss you, Haley! So, up next is TLC and Lil John (Yeee-ahhh), who are obviously lip syncing. They are performing with Naima, Asht(h)on, Karen, and Thia. I’m not going to lie…I forgot about Thia. This was a little lame. Scotty McCreery and Tim McGraw sing a duet, where Scotty actually sounds better than Tim. Maybe Scotty will be pretty good! JLO & Marc finally get their moment in the spotlight, with JLo trying to outdo Beyonce’s booty. Sorry, JLo, Beyonce gets to booty shaking edge tonight. The guys sing a little Tom Jones medley with Tom Jones. The girls get Beyonce and the guys get Tom Jones? Really? Lauren and Scotty are up next and each got to invite a favorite teacher to the finale! I’ll bet they were thrilled! Aw, and then on top of that, they get a car! Yay for the teachers! This is my favorite moment of the show so far. They had to do the teacher bit off the stage so they could prep Lady Gaga on the stage next. She is standing half naked on a cliff. Scotty, you better kiss your cross! Lauren is up next singing with Carrie! And Lauren was schooled. SCHOOLED. Carrie held that whole duet, and quite frankly was holding back to not overshadow Lauren. Consummate professional, that season 4 winner. Beyonce singing her new single regarding a first grade math problem. But her emotion on that stage? I want to vote for her. What is her number, Ryan? Getting towards the end, I thought perhaps a Lauren/Scotty duet. But no…Spiderman. Bono is a classic, but this was more filler. The last pre-announcement performance was by Mr. Steven Tyler who proved that he may be irrelevant at the judges table, but he is still relevant on stage, despite being snubbed by his band. I was hoping he might perform with the kids, but alas, there was no Gokey this year, so he held it on his own. Finally, in the least shocking results show ever, Scotty takes the crown and we have to hear arguably the worst hit single to come out of this show. When I heard it last night, I dreaded this moment. However, it seemed slightly less annoying because I was distracted by the streamers, confetti, Jack Black’s snub, and JLo and Haley having a convo in the background without claws or death eyes. Whelp, here at idolreview.net, we (meaning I) rooted for the girls, and failed yet again. For all the Laurens, Haleys, Crystals, Syeshas and Allisons out there, one day we will again be victorious! There is always season 11, after all. Thanks again, all ye readers, for a great season of Idol. It has definitely been one of the most controversial ones in awhile. I appreciate your comments and read every one! Remember to follow me on Twitter, Facebook, and tune back in in September, because I will be blogging X Factor! Simon and Paula together again? How could I not watch that inevitable trainwreck. I’ve been procrastinating on writing this blog all evening. Like if I put it off a little longer, I could avoid the reality of losing my fave contestant this year. Not that it was a total shocker or anything. As a big fan of underdogs everywhere (and especially on Idol) I kind of get used to having my fave ousted. But for some reason, my optimism took over and I really thought Ms. Reinhart had a shot at the finale. And by her facial expression after Ryan announced Lauren had the second spot, she thought she had a shot, as well. But alas, here we are, with the predictible country idol finale. Uncle Nigel can be happy to have all sorts of country duets scattered throughout the two hour episode that happens in only 6 days. The silver lining for me is that I will be able to enjoy next Tuesday’s Glee finale without having to copy and paste the word “vote” into a text 400 times. I’ve never been much of a multi-tasker anyway. But back to tonight’s results show. The episode where you could have tuned in at 8:52 and not missed anything. The kids start out at Bad Robot productions. So if they would have taken me into Bad Robot productions, I would have demanded to have a little chat about Lost before anything else. I still have a few unanswered questions. Like Sayid ended up with Shannon instead of Nadia? I’m still mad about that one. Haley’s homecoming in the NW suburbs of Chicago looked pretty exciting. The concert venue was the same location as Lee’s venue last year. Next up…Lame Ford Videos? Italian hipster opera boy bands? For realz? WTF am I watching. Time to make a snack. Scotty’s homecoming looked packed…with not one male besides his dad and Josh Turner showing up. Every one of those girls has an unlimited texting package, obvs. Nicole Sherzinger looks like her dress went through the garbage disposal. Lauren goes home, and again, has a crap load of people show up. I must say, I am impressed with the turnout of these visits. Way to go, hometowns! All three looked like a rockin good time. And we end with the results: Scotty is in. Lauren is in. Haley is out. My mourning period begins. For her swan song she rocks out to Benny and the Jets (I wouldn’t have chosen that as the final sing-out number, but it was ok). JLo looked like she was giving Haley the evil eye when she said “Randy and JLo have you seen them yet – oh but they’re so spaced out” in the lyrics. I thought it was quite a fitting lyric change! I am hoping she gets a major kickass duet next week. Perhaps a few to balance out the country numbers. See you at the Nokia next week (for country hour). So…do you think the right two made the finale? From your previous comments, Haley was a very love-her-or-hate-her contestant. I imagine there are a whole host of people who are happy to see her go. (Clearly, I am not one of them). But sound off in the comments! Prerecorded performances with fangirls jumping on the judges’ podium! Fearing Gaga would fall off the piano bench in those boots! Jordin giving a kickass performance of a bad song, but looking hawt doing it! …and finally. After a long wait. And 46 minutes of filler. We find out that Haley is safe. (!!!) Wowzers. At that point, it was pretty obvious that James was headed home (for good) because there was no way that Scotty the Body was getting voted off. As for the duets tonight, Haley and Lauren obviously win. And they both had moments where they sounded fantastic. The guys duest was just awkward. What was with the little girls? Haley can pull of the country but James is just weird in that format. I think we can guarantee that no one including himself would ever want to hear him sing country again. Just to dwell a little more on the victory (!!!) of Haley achieving top 3. She is like the little engine that could–she just keeps chugging along. I wonder what type of sabatoge efforts are currently underway to undermine her next week? Perhaps she will get slushied to cross-promote the Glee finale? At any rate, I think there was a bunch of outrage at the judges comments, which coupled with her outstanding and consistent vocal performance, produced a significant rock the vote campaign. Watching Ryan announce Haley had earned a gold stool was not unlike hearing Brian Williams announce Obama had won the 2008 election. (Ok, I’m being dramatic again.) But there was a pretty significant blogosphere grassroots effort to save the growler, and I couldn’t help feeling I contributed with my 200+ text votes. I think that if the judges would have given equally fantastic feedback to everyone these last few weeks, there would be less outrage and Haley probably would have gotten voted off. So as much crap as she has had to endure during the “judges feedback,” it probably has played a part in her sticking around. I am also happy for Lauren and hope that she can finally have her idol moment. She will have 3 shots next week. I am looking forward to her steping up her game. If not, she will probably be out next week. And as for Scotty? It remains to be seen if either of these girls can slay the beast (aka Scotty’s voting block). I’m not sure it can happen. I hope for the sake of my sanity that Scotty has an amazing idol moment, as well, and prove to AI viewers who are not Scotty fans why he deserves to win. In other words, everyone needs to Bring It next week. Have fun in your private jets, kids! Another night of results is upon us. I am hoping there is some justice left in the world, and Jacob goes home. The kids sing “Happy Together.” This group song was just bad. The girls tried to hold it together as much as they could, but the whole thing was a real trainwreck. All I’m saying is that a Haley–Lauren finale would be all sorts of awesome. The Ford music videos are getting lamer and lamer. The kids do a stint with the (mean to Stefano’s mom) Gordon Ramsay, where they each had a chance to show off their cooking chops. Lauren wins with the best tasting (and best looking) omlet. Jacob’s “omlet gone wild” is the second best. Lady Antebellum sings after the break, and they are pretty good. Finally, some results! James is up first. Jimmy didn’t like his performance last night. And I think someone is getting Huffed! He is asked to start a group on the far side of the stage. Lauren is up next and Jimmy thinks she will be bottom 2. She is asked to stand on the near side of the stage. After the break we find out that Lauren and Jacob both hate tofu. I happen to love tofu. And Jen likes to wear shiny pants. I also do not like to wear shiny pants. It is 8:42 and maybe we will finally get back to the results…nope, a new JLo video. If any results show could have been a half hour, tonight could have been the one. Good god this is a lot of filler! Will the Huff-ee be Scotty? Jacob stands with Lauren. Haley is up next and stands with James. That means Scotty is the Huff-ee. He is declared safe. Ryan of course asks him to stand with the safe group. Scotty refuses, and is finally led by Ryan to join James and Haley, who are declared safe. That leaves Jacob and Lauren in the bottom 2. Lauren already sheds a tear. After the break, Lauren is declared safe and Jacob is sent packing. Jacob sings A House Is Not a Home, and gives one of his best vocal performances ever (until he is egged on by his fellow castmates at the end and finishes with some signature Lusky Stank for good measure – hahaha). Finally this show has some justice. And for the first time since the top 12, we have gender equality. I had little hope for the women after Pia’s untimely ouster, but these two girlies have held their own. Could they make it to the finale? Could they? I still doubt that, but this is a small victory for female idol contestants of present and future. After intros, applause, and a jab at Charlie Sheen, the results show is officially underway. The kids celebrate Wills and Kate (Will you be waking up in the middle of the night? I will, but I will probably find it on youtube, too). None of the Brits know who these idols are. Carole King medley! So I had a brief vision of a Lauren/Haley final two during the “One Fine Day” portion of the medley. Ha – like when hell freezes over, right? But I can dream. James sounded fantastic – all the other guys were unimpressive. This Ford music video was the most boring video yet – if it weren’t for the Eames Chair, I would have fallen asleep. Bow-Er-Sox is back, with a whole new set of teeth! I’m not going to lie – I always found them distracting last season, but it makes all the difference! Kudos to her dentist. And actually, the song was pretty catchy, too. Haley is up first. She gets pissed at Jimmy Iovine’s comments! Good girl for speaking up. Don’t let him throw you under the bus like that! Scotty wants to have intimate moments with the audience. But he is sent back to the bench with no results. Lauren needs to work on not just hearing the negative. She is also sent back to the benches with no results yet. Casey takes center stage. Says that his growl is because his large passion has to get out a small hole. That is called labor, right? He is also sent back with no results. Ryan, this is just getting dumb. James gets the same treatment. Jimmy says he needs to pick the right songs (doesn’t everyone?). Ryan declares him SAFE! Jacob is up and, well, Jimmy says he is in trouble. After the break (and a fake Bruno Mars performance, and another break) Lusky Stank is sent back to safety. Scotty and Casey are sent center stage. An we all know how this will end. Casey finally meets the fate America sent him to 5 weeks ago. And he ends his run with the Best. Singout. Ever. It was a little ADHD, but in a fun way. And he ends with giving his rumored-pseudo GF an eye bonking. Totally the way to end your Idol run, Casey! But let me ponder this phenomenon for a moment – who the eff is still voting for Jacob? Who are these people? Dude needs to seriously be voted off this show. To tie in all the Fresh Prince references – He ain’t got to go home, but he’s got to get the hell off this stage! Let me also ponder this…will we get to see these kids each sing twice next week? Back in the day, top 5 sang twice. I would love to see this tradition resumed. So, are you happy with the results? I would have liked to see Casey hang around until next week and Jacob exiting, like, yesterday. But I knew it was getting to be about his time on this show. I also feel like he never quite lived up to that potential that we saw in Hollywood week, and like others before him (Andrew Garcia, anyone?) that never bodes well. Even after the save, he never took full advantage. But I think he will go on to have a career in music, even if that isn’t necessarily solo performances. As usual, tell me what you thought in the comments!